I painted my "Hopes And Dreams" painting during a couple of cold and gloomy days last February. 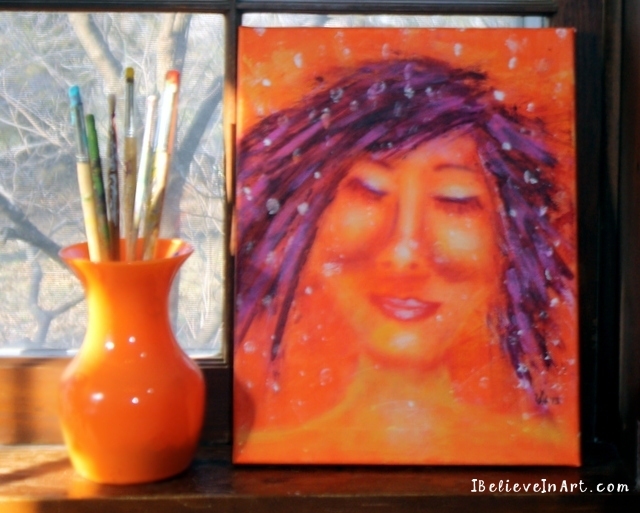 I was feeling a bit discouraged, a little "blue" you could say, so I grabbed my orange paint, the opposite of blue. I added details with a rich, warm purple. I had some fun with playful pink. And when I was done I was a lot happier, just not quite as happy as the face I had created on the canvas. I wondered what her story was. What could possibly be making her so happy? Were all her dreams coming true? I didn't think so. That would be an eyes open, wide smile happiness. This was a more secret happiness, a from within kind of joy. Her eyes were closed because she was dreaming, her slight smile was the involuntary side effect of hope. And that's when I realized that our hopes and dreams make us happy long before they come true.